The garage has always doubled as a storage space. In fact, few homeowners find it difficult to quickly fill up their garage with various possessions and belongings. The result? There is no room left for the family car! Thanks to today's modern storage units designed especially for the garage, the garage can function as a place to store both your belongings and your car. The trick lies in devising a plan that fits your specific storage needs. How do you do this? Begin by figuring out exactly how much garage space is actually available and by dividing that space into function-based zones. For example, designate areas for recycling receptacles, automotive products, and home maintenance items, as well as tools, lawn and garden equipment, and sports gear. Pick a day or a weekend to devote to the project, and remove everything — that means everything — from your garage. Now it's time to prioritize what stays and what goes. Begin by putting the largest things back in place first. Start with your car, and move on to items like garden tractors, lawn mowers, and exercise equipment. As you go through what you've been storing in the garage, throw out or donate anything you don't use or need any more, and find other places for items you want to keep, that don't need to be stored in the garage. Once everything that must be stored in the garage is back in place, you'll know how much storage space you have left. When that is determined, you can begin to look for a storage system that best suits your needs. Most garage storage units are designed to make the most of vertical space, freeing up the interior space of the garage for the car and other large items. Storage systems can be cabinet-based or wall-hung. Cabinet-based storage systems do take up some floor space; if you choose this type of system, you'll have to measure to make sure it will fit and allow for the opening of car doors. Some cabinet storage systems are modular and have wheels, which allows you to change your storage setup according to your needs. Most wall-hung systems, on the other hand, project only a few inches into the room. Depending upon their storage needs, many homeowners choose a combination of the two systems. 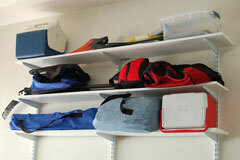 Manufacturers of garage storage systems often make complementary wall-hung and cabinet-based systems. In addition to these two storage approaches, many homeowners use simple open shelving units and wall-mounted pegboard with hooks. If you use open shelves, place heavy items on lower shelves. 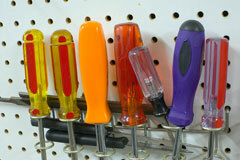 Pegboard hooks are a popular choice for small tool storage. If your garage ceiling is high enough, consider installing ceiling hooks for bulky items like lawn chairs, extension ladders, and bicycles. 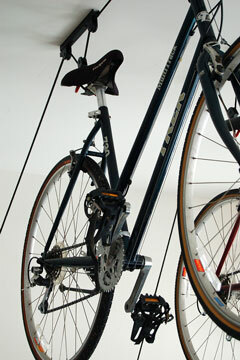 You might be surprised at how much floor space you can free up by storing such items overhead instead of on the floor! Finally, be sure to consider all relevant safety issues when storing items in your garage. For instance, hazardous chemicals and power tools should be stored out of small children's reach, and sharp or heavy items should be stowed safely as well. Gladiator Garage Works - complete garage organization system. Premier Garage - garage flooring, cabinets, and organizers. Car Guy Garage - cabinets, storage, flooring, and organization. Garage Envy - garage storage cabinets, flooring, and accessories. Slide Lok - cabinets and floor coatings for garages. This garage storage products supplier directory lists garage organizer suppliers throughout the USA.